NGO Drive Smart Drive Safe’s unique project titled ‘#1CroreHaathSaathSaat’ is slowly gaining momentum day-by-day. A first-of-its-kind in India to support the cause of alarming road deaths, the project envisages participation and engagement from the general public in the form of ‘Human Chain’. This ‘Human chain’ will be formed during the upcoming Road Safety week in Delhi starting from February 4 to 10, 2019. The project has initiated a nationwide public debate about road safety as various organisations, corporates and local people will be participating. 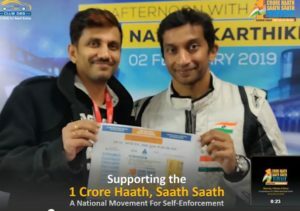 The organisation has also roped-in ace Formula-One driver, Narain Karthikeyan to support this cause. The event will be a platform to fight road deaths and reward for good driving behaviour. In remembrance of 1.4 million road death victims, a two-minute silence will be also observed on Feb 8. The event will take place in 100 cities which will correspond with activities in Schools, Colleges and at organizations.